Ever since I discovered and studied Dr. Suzuki's teaching philosophy, I strongly support and incorporate the Suzuki Method into my pedagogical practice. I believe in the values of the Suzuki Method such as exposing a child to music as early as possible, encouraging family support, learning from peers, and most importantly developing character while studying music. It was Dr. Suzuki who believed in his heart that every child can learn music; and I have taken that ideal to my heart as well. Not only can every child learn music, but also every child can impact another person's life through the wonderful gift of music that has been given to him. Since I do use the Suzuki Method as part of my pedagogical practice, I encourage my student to be enrolled not only in private lessons, but also in group lessons. Even though the student learns his repertoire, techniques, and theory in his private lesson, the group lesson is what distinguishes the Suzuki Method among other curriculum. 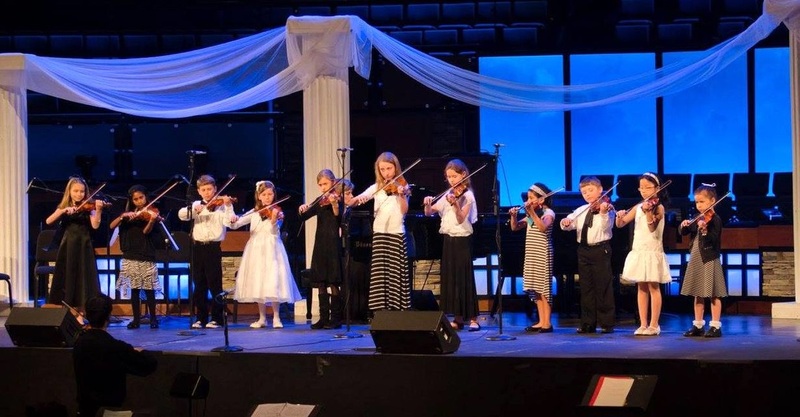 In group lessons the students are inspired by their peers, their music is reviewed which builds a memorized repertoire, and lasting friendships develop. Teaching music is my passion, and I hope you consider enrolling in my studio for music lessons not just for music's sake, but because you value the impact that music can have in your life and the lives of others around you. Proper technique is essential for any healthy approach to virtuosity; therefore, part of the fundamental principles that I teach my students incorporates an effective way to hold the instrument while also maintaining a natural and relaxed body posture. My first focus is to teach my students proper posture when holding the violin. The body is the pedestal for any instrument; therefore, the body's structure must remain in its most natural and comfortable position while supporting an awkwardly placed instrument such as the violin. By keeping a natural body posture, the risk for any muscle cramp or back injury is reduced allowing the student to perform to his greatest potential. If the student learns to keep a proper grasp to his instrument, he will discover that any technical execution will have consistent results and greatly reduce the possibility for injury. On the same level of tonalization, I desire to develop my students' ear for intonation. To achieve great if not perfect intonation is a constant and ongoing struggle for every string player. Unfortunately, it is the easiest feature to be criticized about string players. As a means to improve a good sense of pitch, I first encourage my students to listen to classical music and their current repertoire on a regular basis as well as record themselves playing. Second, I work to improve their left hand technique which yields a more consistent intonation. Students must develop a proper left hand position that will remain consistent when placing fingers down for notes. By listening to music as often as possible and developing a consistent left hand position, my students will develop their ear and accuracy/precision for intonation. Finally, all of my students will participate in concerts and recitals as a means of sharing the wonderful world of music with friends, families, acquaintances, and even strangers. Of course, what is the purpose of learning to play an instrument well if one does not share his music with others? Performing for others is a gift to the audience, builds a confident demeanor in the student, helps the student to control anxieties, and teaches the student to focus for extended periods of time. I cannot stress enough the importance of sharing music in every opportunity that may arise. While learning to play an instrument provides a great amount of joy for the individual, the benefits of playing an instrument stretch beyond the realm of music. The study of music molds life-long character traits, and these character traits then transfer to the individual's work ethic which builds potential for a more successful and fruitful life. I want to now discuss several benefits that a student of music acquires while dedicating himself to this particular study. A primary trait gleaned from studying music is confidence. Frequent performances and determination to learn difficult works and techniques yields much pleasure in the sense of personal and public accomplishments. I try to explain to my students that performing is not a life or death situation, but rather it is a time to share what he has accomplished thus far with those who appreciate music. This confidence comes from the fruit of his hard work after he develops his repertoire through countless hours of practice. Another life-long character trait is the student's ability to remain focused and alert. A majority of students only come to lessons once a week. After a student receives his instructions, he is then responsible to practice the rest of the week independently. In essence, he must continue to teach himself, listen, and find solutions to problems which takes a lot of intelligent work. Focus is developed through a student's extensive individual time spent alone practicing and from listening to intricate details in his music. Focus is also developed from performing experience. Every musician only has one chance to deliver his music to an audience. During his performance, he must have trained himself to be alert to one thing: only the sound coming from his instrument for the next three, five, seven, or even fifteen minutes of music depending on the level of his ability. If an individual is capable of being trained to remain focused for an extended period of time in music, he will be capable of retaining detailed information in other areas of his life.